It’s a long-standing tradition for many of us. 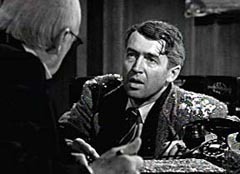 At least once each Christmas season, I have to watch the classic, It’s A Wonderful Life. In recent years, what I had previously viewed as simply a feel-good Christmas flick has now seriously morphed in my thinking. I have begun to realize that George Bailey’s desperate personal struggle conveys much more than a warmhearted, life-turnaround story. With deeper reflection, we encounter great wisdom for discovering personal significance in our daily work. Consider it. Working hard to serve others never guarantees immediate “success.” In fact, such posture often leaves us feeling frazzled and forgotten, beleaguered and belittled. George and the entire Bailey Building and Loan enterprise endlessly wrestled with doing what was right—selflessly serving others—and yet never getting ahead. George Bailey does consistently make right choices, but again and again, he’s filled with regret and seethes inside with raucous feelings of pointlessness and emptiness—even jealousy and anger—over others who seem to succeed and have easier lives. For George, intentionally working to do the right thing feels difficult, lonely, and fails to land him in first place. Even as we focus at Christmastime on Jesus’ coming and his service-oriented mindset (Phil. 2:4-5), we can easily feel conflicted. We are busy and pushed with extra demands and distractions. We feel the crunch of end-of-year expenses and deadlines. We encounter the relational strain of coworkers and family who are frazzled and grumpy. We even wrestle with déjà vu, easily recalling the “ghosts” of Christmases past, those years that were less than snow-globe-like. He courageously saved his brother’s life, but he lost his hearing in his ear as a result. His big dreams of traveling & making a million—they’re always just out of reach! He stayed stuck in Bedford Falls, tediously tending to the oh-so-slow, seems-to-never-really-grow, Bailey Building and Loan. The Bailey family stood in stark contrast to grumbly old Mr. Potter, the mean, fat-cat tycoon who seemed to own everything else in the town. While embarking on his honeymoon with Mary—just like George’s dumb luck—the stock market crashed. There was a run on the bank, and the newlyweds ended up using their honeymoon money to hold people over. They settled in Bedford Falls and started renovating the old Grandville House. As years passed and kids came along, George found himself more and more disillusioned, constantly embroiled in business conflict with Potter. Life felt cold and desperate instead of wonderful and fulfilling. When World War II began, George couldn’t even be drafted and travel the world on account of his injured ear. His kid brother, Harry, went off to war, and of course, he ended up a hero! Christmas Eve, Uncle Billy misplaced $8000 of the Building and Loan’s money, actually mistakenly placing it in Potter’s hands. Unaccounted for, such missing money would mean financial disgrace and scandal for the Bailey Building and Loan and George’s whole family. If we pause to reflect, we discover that George Bailey’s story shows us a handful of rich insights for finding greater significance in our daily work. For starters, George’s condition proves . . .
God uses ordinary, struggling, disturbed, fearful, down-on-their-luck people to change the world. It was true in God’s personnel plans for bringing Jesus to earth. (Just look at the lineup in the family tree, the genealogy of Matthew 1.) It’s powerful to realize that Jesus came to bring us hope and joy, and God still uses everyday, ordinary people like us in his process of redemption and transformation. Consider the fictitious angel in George’s story—Clarence, the funny little guy who needed to earn his wings. “Earning wings” is a fanciful add-on in this movie (not biblically-based). Nevertheless, there’s no mistaking the connection with God’s angelic messengers who play a huge role in the original Christmas story. And we gain this second insight for discovering greater significance in our daily work. God cares. God communicates. And we can connect with him. Whether it’s the angelic messengers in the biblical accounts, God’s often-stunning orchestration of events in our lives today, or his precious written Word—readily available for us—this much is certain. Christmas reminds us that God communicates so we can connect with him. Take a few moments to explore these examples of God communicating, so we can be blessed for greater redemptive connections: Gen. 12:3; Isaiah 9:6-7; Micah 5:2-5; and Hebrews 1:1-3. Christ brings us such hope! Christ gives our daily work real significance as we serve others—to his glory. A life of serving others is wonderfully abundant and leaves a HUGE impact! Business that effectively serves others will generate value and expand the total pie. Profit is indeed a sign that others are being served. Business cannot neglect efficiency and profitability or it will cease being able to serve others. Serving investors means that we’ll generate a return on their investment (Matt 25:14-30). Two questions will serve us well as we consider greater significance. First, will you deeply connect with God this season, with his heart and purposes for your life? No matter how discouraged you feel, you can cry out like George, “God help me. Get me back! I want to live again!” God cares and promises to supply you with his hope, purpose, and joy. And second, will you intentionally adopt a Christ-focused purpose in your daily work, to serve others to the glory of God? Jesus said in John 10:10, “The thief comes only to steal and kill and destroy. I came that they may have life and have it abundantly.” Such abundance can overflow as we bring greater significance to our daily work. Serving Christ to the glory of God—such purpose imbues our daily work endeavors with greater significance, allowing us to truly live a more wonderful life! Ken Eldred. 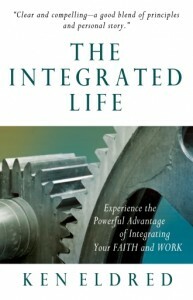 The Integrated Life: Experience the Powerful Advantage of Integrating Your Faith and Work. Manna Ventures: Montrose, CO, 2010, pp. 44-45.